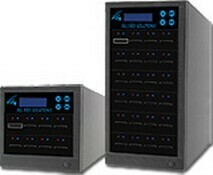 Newly added to the All Pro Solutions duplicator family, the M-USB Duplicators conveniently copies portable USB storage drives without a computer. Advanced asynchronous duplication means no waiting and no interruption as each channel can independently load, unload, and copy. The new USB Duplicators also features user friendly 4-key control with LCD, high speed duplication and bit-by-bit Compare function to confirm successful copies. Reliable, affordable, and convenient, the Spartan USB Duplicators are the best companion for any industry. Available in 3, 7 or 15 targets. 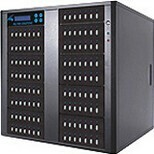 The USB Series USB duplicators easily and reliably create multiple copies of your USB cards without a computer or cumbersome software. Each USB channel has dedicated copy throughput of up to 2GB per minute. Asynchronous copy allows each channel to function independently and copies directly from 256MB of buffer memory so there is no need to start and end a copy cycle at the same time. Source Analysis feature identifies the content on the master and intelligently copies only the data to speed up copy cycle. Fast, reliable, convenient and cost-effective to operate, M-USB Series USB duplicators help you to get more done in less time! Available in 7, 15, 23, 39, and 63 targets! *Standalone turnkey system; no computer required. *Support all file formats, file size, and card/drive capacity. *High speed copy up to 2GB / min! *Real time copy and compare technology to ensure successful and complete copies.